How energy dense do you want to make your rack. 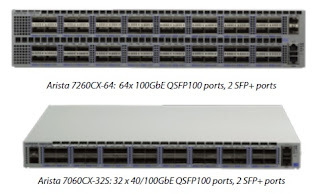 Arista announces two new switches that certainly fit high density, high speed ToR models. Loaded with QSFP100 and backward compatible all the way to....10Gbps. This really drives the concept of the "logical rack" the number of racks that can be covered by a pair of ToR switches in the Spine and Leaf architectural model. Let's conduct a short breakdown on the 32 port unit.